quebec teaching trip (part 3) | doberman pizza. The second day of my stay in Victoriaville (technically the third, but I’m not counting the part-day when I left Drummondville with Nicole) started with me looking after Alex for the day while mom and dad were busy at work and at pre-natal class (guess who went where). We also got a visit from Julien and Angèle, who brought me an order of bread from their daughter’s local bakery, “Les pains d’autrefois” – yum! Julien and Angèle, steadfast pioneers. 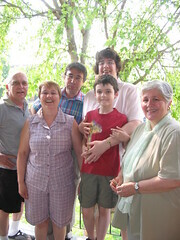 In the evening, I paid a visit to Benoit, another one of the Baha’is in Victoriaville. He’s currently working at an economic development organization called “La CLÉ”. Oh those economic development organizations. Benoit is big into socio-economic development projects. He spent around a decade with his wife in French Guyana, and raised his kids, Oliya and Aurélien, out in the jungle. 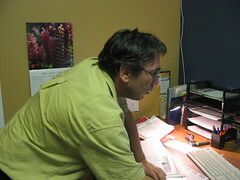 Benoit, busy at his desk as usual. The next morning was Saturday – but it was no time for cartoons. It was time to climb up onto the roof and rip it apart! 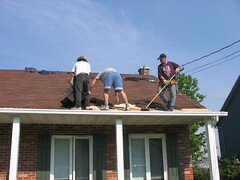 Geneviève and Craig had decided to finish the long-delayed work of re-roofing their house during the weekend, and called in friends and neighbours of all stripes to help. I helped out as best I could, despite my lack of upper body strength and poor manual skills. Alex wanted desperately to climb on top of the roof to help us, but we managed to talk him out of it (for a while). Tearing the shingles out, one by one. I acted as a gofer most of the time – which means I was scooting up and down the scaffolding, bringing nails, tools, and drinks (and running after the drinks when they accidentally got knocked off the roof). It also meant I had a little time to take photos, which suited me fine. Finally, at noon we called a time-out for lunch, and devoured the delicious subs prepared with care by Geneviève and Monique. Much gratitude! 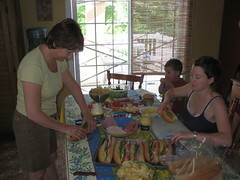 Hard at work preparing a scrumptious lunch! I somehow got my hands on this too. 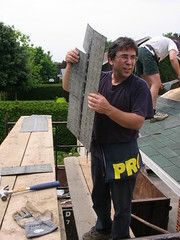 The day wore on, and we were still nailing shingles into the roof as the sun went down. It was quite dramatic. 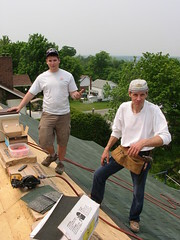 Before the day was through, Alex finally got his wish to climb up to the roof, aided by Joshua, Craig’s intrepid Kiwi friend, who was driving back from Thetford Mines with his wife Tamarih, when they both decided to stop and say hello. We got off the roof, lingered with our visiting friends, chatted and reminisced – what a pleasant way to end the day. tonight is my last night in Victoriaville; tomorrow afternoon, I’ll be catching the 5:20 bus out of here and back out to Ottawa, so that I can get back to work bright and early on Monday… I’m really glad I took the time to come down here and catch up with people. things have gone beautifully throughout this trip, and I’ve been able to catch up a little with lots of people – including almost the entire Bahá’í community of Victoriaville.… Continue reading ? 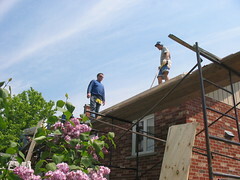 The next day started with a bang (several bangs actually – they woke me up early) and work on the roof commenced posthaste with a fresh group of stalwart roofers to help with the task at hand. Today I was less available, though – I was also packing, getting ready to return to Ottawa in the afternoon. I was still available to take photos, though. Hard at work figuring things out. By a happy coincidence, Sunday was the day of the Feast of Núr. 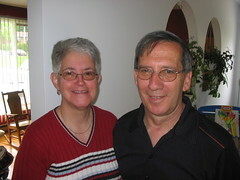 Instead of spending it in Ottawa in a huge hall with hundreds of Baha’is, I spent it in the humble home of Maurice and Marcelle Turgeon – where I first lived when I arrived in Victoriaville – with a small band of devoted friends. I got to re-experience the feeling of closeness and family that permeates Baha’i gatherings in the small Baha’i communities where I used to serve. I told them a bit about life in Ottawa, and the intense pace of activity that characterizes the Baha’i community there – such a contrast, and, I hope, a source of inspiration. Before long, it was time to say good-bye. I packed a few last things, took a few final pictures, and hugs and farewells were exchanged all around. I really enjoyed this trip. I expected to do more – for instance, to stop by Trois-Rivières on the weekend – but I think God had His own plan for me, using me where I was needed. I mostly did home visits with the Baha’is, talking with them, encouraging them, and helping them out in little ways. I guess that was enough. I love these people. Going on this trip renewed my confidence. Bahá’u’lláh writes, “The source of courage and power is the promotion of the Word of God, and steadfastness in His Love.” It gave me courage to be able to tell people about His message for humanity. Sure, I didn’t do a perfect job of it, and I could have done more of it, more frequently, with more zeal and vigour, but I did what I could. I got to encourage a lot of my Bahá’í friends who were downhearted, and bring some light and joy into their lives. I got to be a “servant of the servants”. That meant a lot to me, and it made me feel like I was really making a difference. Beyond that, it just felt good to do – it felt right, like I was fulfilling my life’s purpose… Continue reading ? So, it was an amazing time – a great follow-up to the Young Adult Forum, too. 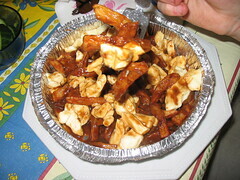 Take an uplifting weekend in Mississauga, add a bus ticket to rural Quebec, add some prayers, a willingness to serve in whatever capacity is needed, and love for all humanity, mix it all together with the power of the Creative Word of God, and you’ve got yourself a recipe for an awesome teaching trip. I may have felt like I did nothing, but how lucky I feel to have done the nothing I did.